Meet with parents and students who are refusing or thinking about refusing the PARCC. Enjoy the premiere of “The Other PARCC: Parents Advocating Refusal on High Stakes Testing,” a short documentary film by Michael Elliot made with support from MCAS, before it is released nationally Sunday night. Michael has also made a refusal film for Change the Stakes (see below) and has worked with Class Size Matters. Also meet Michael and the parent and student Refusers from Montclair and across New Jersey who appear in the video. Parking is available at Bay Street station parking deck on Pine Street for $7. 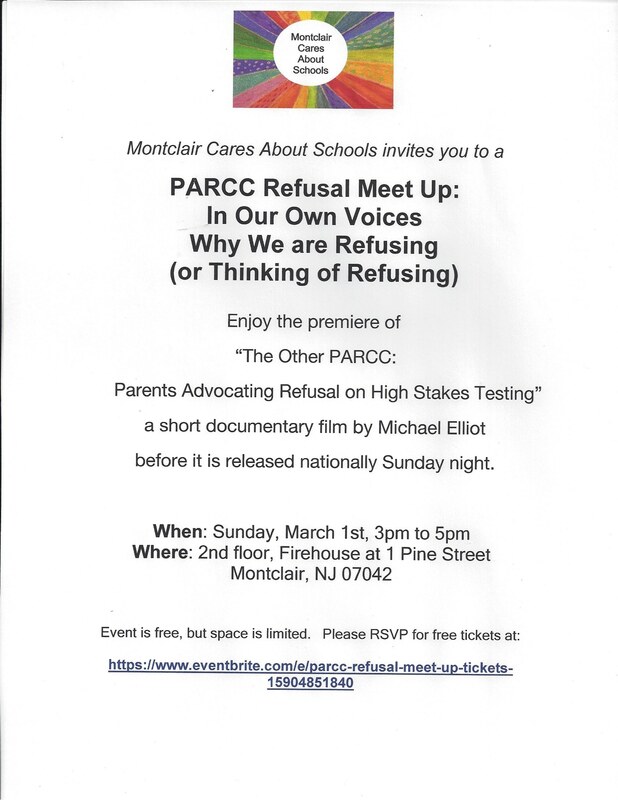 This entry was posted in Elementary School, High School, Middle School, Montclair, New Jersey, Opt Out-Refuse the Tests, Take Action, Uncategorized and tagged change the stakes, class size matters, film premiere, Michael Elliott, PARCC refusal, Refuse the tests, short documentary, The Other PARCC. Bookmark the permalink.